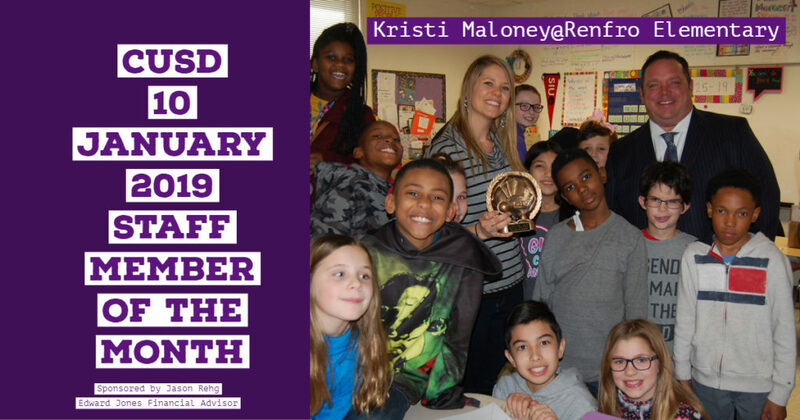 Edward Jones representative Jason Rehg presented the January 2019 CUSD 10 Staff Member of the Month Award to 4th grade teacher Mrs. Kristi Maloney at Renfro Elementary School on Friday, January 25, 2019. “Mrs. Maloney is always looking for ways to have real conversations that motivate and encourage kids. She tries hard to create readers and better humans,” said Bauer. Jason Rehg sponsors the monthly award to recognize outstanding members of the CUSD 10 team.